Administrator and AAMVA Region 1 President, Chrissy Nizer, has chosen The Leukemia Lymphoma Society (LLS) as the charity of choice for the 2019 AAMVA Region 1 Conference in Cambridge, Maryland. Chrissy Nizer invites AAMVA members and conference attendees to join her in the fight against blood cancers by donating to LLS to support their mission to cure blood cancers. The MDOT MVA family and AAMVA are committed to finding a cure for blood cancers and support all our colleagues, family, and friends that have been affected by this disease. We have been touched too many times by cancer within our organizations and hope that we can make a difference by working with The Leukemia & Lymphoma Society to put an end to cancer. 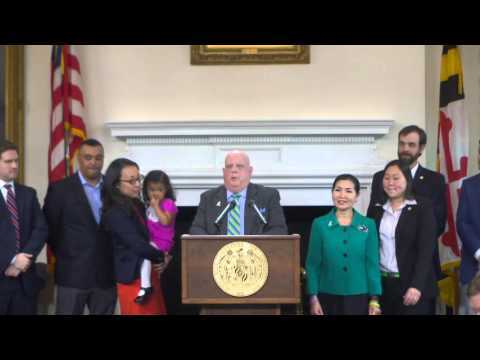 Maryland Governor Larry Hogan was diagnosed with aggressive Stage 3 non-Hodgkin’s Lymphoma a few months after he was inaugerated in 2015. After undergoing several types of treatments, he announced that he was 100% cancer free and in complete remission. Join AAMVA and the MDOT MVA in support of LLS' mission to cure blood cancers and provide a better quality of life for patients and their families. We hope that you take a moment to join us in the fight against blood cancers. $25 helps fund an episode of the LLS Bloodline Podcast series to provide information to patients and healthcare providers. $50 helps fund LLS educational booklets for healthcare providers and their patients. $100 helps fund the training of Patti Robinson Kaufmann First Connection Program volunteers, who provide peer support to patients and their families around the country. $200 helps fund the LLS Information Resource Center’s Information Specialists, who provide the latest information on blood cancers and support to patients and their families. $200 helps fund general lab supplies for one week to help LLS-funded researchers conduct laboratory work needed to develop blood cancer treatments. $300 helps fund one week of an LLS-sponsored online support group for patients and caregivers dealing with a blood cancer diagnosis. If we reach out goal of $10,000 we can dedicate our donations to one of the nine disease-specific research portfolios or provide a web-based disease-focused national education program for patients and healthcasre providors.